From January 1st 2018, Aldi* have been pleased to announce their entire own-label household and beauty range has been accredited as cruelty-free certified by leading animal protection organisation, Cruelty-Free International. How amazing is that?! They are proud to be only one of only four UK retailers to have been awarded the gold standard leaping bunny certification across both our household and our health and beauty ranges so when you're next in one of their stores look out for the internationally-recognised leaping bunny logo and you’ll know that no new animal tests were used in the development of that product. "This is hugely important to us and our customers. It makes cruelty free certified products more accessible and affordable" confirmed Aldi* UK’s Managing Director of Corporate Responsibility, Oliver King. "We congratulate Aldi for demonstrating its commitment to eliminating animal testing and helping customers make a cruelty free decision when purchasing cleaning products" added Cruelty Free International Chief Executive, Michelle Thew. Of course, that’s not all Aldi do to support animal welfare - they are also the second largest retailer of RSPCA Assured products in the UK! So why not scrap going to your local supermarket and start shopping at Aldi* from now on? This is such a helpful post, I really want to change my cleaning products to all natural. I've switched some but not all yet. I've never tried Aldi, I normally use Astonish products, or I use Ecover for washing! I love that you're cruelty-free! That's so wonderful. Thanks for sharing! You know I’ve never considered whether cleaning products are cruelty free or not. But I’m glad you’ve brought it to my attention! Great post. I didn't know that cleaning products were tested on animals, that's absolutely awful! Glad to hear Aldi's products are cruelty free. Great post! It's great that Aldi are doing a cruetly free range - more brands should do it! It's easy to remember when it comes to purchasing make up that cruelty free is the way forward as so many people talk about CF beauty, but I often forget that things such as household products can also be tested on animals, so thank you for this important reminder! 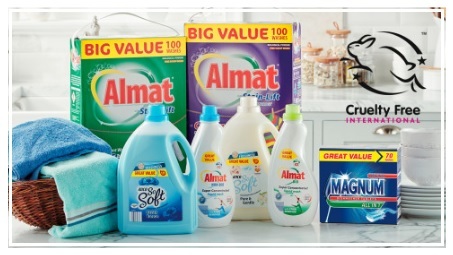 I'm going to start shopping at Aldi a lot more after the summer, because my new house is located very close to an Aldi shop, so I will certainly be buying from their cruelty free cleaning range! I love Aldi and use most of this already myself. We use aldi products in our home FOR this reason. R, my boyfriend is vegan so I've always gone to every effort to help him be cruelty free with everything. So cheap and great products, makes you wonder why big brands still do it?! The closest Aldo to us is so far away but I love that they do crulity free products!